This eye-catching camera is slim enough to fit easily into your bag or pocket, while also boasting an impressive 20 megapixel resolution and 4 x digital zoom. It lets you take HD video, while the 2.7-inch screen is perfect for framing and reviewing all your video and images. 20.1mp cmos sensor for good images in low light. The VXX128 allows you to take breathtaking pictures wherever life takes you! You’ll never have to worry about being too far from the action. Equipped with 8 different scene photo options and 4 flash options this camera has it all! Perfect for a sunny day at the beach or a night out on the town. The VXX128 will make every picture look like it was taken by a professional. Never worry about not having someone to take your picture as there are 3 different self-timer options. The built in Anti-shake feature will stabilise every image making blurry photos a thing of the past! 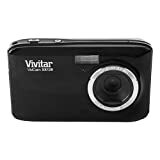 This entry was posted in Discount Photography and tagged 20MP, Black, Camera, Compact, Digital, Screen, Vivitar, VXX128, Zoom by Ball Photo. Bookmark the permalink.